Addressing climate change requires two approaches – mitigation of emissions, and adaptation to its impacts. In this PechaKucha presentation presented as part of the American Association for the Advancement of Science’s Visualizing Science Policy 20×20 event, I lay out the case for how buildings are a critical – if sometimes forgotten – part of the solution. I invite you to watch this talk on YouTube, or read the transcript below. Last September during Hurricane Irma, a tree branch hit a transformer and knocked out power to the air conditioning system of a nursing home in Hollywood, Florida. There were portable air conditioners on site, but they were insufficient, and temperatures rose to a sweltering 110 degrees Fahrenheit. By time emergency responders realized the scope of the problem, 12 residents had tragically lost their lives. It was situations like these that compelled me a few years ago to set aside my career as an astrophysicist and devote my attention towards the phenomenon that’s making extreme events like Hurricane Irma more intense – and that’s climate change. Through this AAAS Fellowship I’ve had the privilege of working with the Department of Energy’s Building Technologies Office. And when I told people I’d be going to BTO they’d say…”Why? I thought you were concerned about climate change.” And I’d have to tell them that in United States buildings consume about 40% of all energy and 75% of all electricity. So if BTO could achieve its mission of making building technologies more energy efficient, not only could we create jobs and save tens of billions a dollars a year for Americans, we could also cut out a significant chunk of our greenhouse gas emissions, and begin to mitigate this massive problem. So I’m going to put my salesman’s hat on for a second and sell you on two energy efficiency success stories. Number 1! This [pointing towards slide] is what refrigerators used to look like – bulky, ugly, expensive energy hogs. But through advances in technology refrigerators have more available space, yet only consume 1/4 the energy, cost 1/3 the price, and allow you to watch cable news right on the refrigerator door! Number 2! Clothes dryers, which consume about 1% of energy in the U.S., largely by heating and evaporating water. But right now researchers at Oak Ridge National Laboratory are working on ultrasonic drying technology in which a rapidly vibrating membrane atomizes the water, which can then be siphoned off as a cool mist. If we can bring this to scale you will be able to dry your clothes in half the time with 1/5 the energy. And I’ve already got the slogan: The Ultrasonic Clothes Dryer – Taking your sock drawer, to Mach 4. But mitigating emissions goes beyond just using less energy. It’s about using the right kind of energy. Every so often I’ll run into a young idealist who will say, “We need to go 100% renewable energy! More wind! 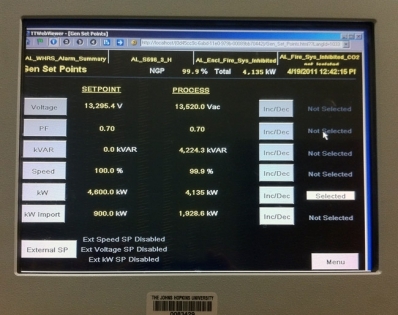 More solar!” Our electric grid must balance generation and demand in real time. And while admire the idealism, how do we meet demand when the sun stops shining and the wind stops blowing? There is a new device that’s made its way into about half of all buildings, and that number is rising. That device is the smart electricity meter. And what’s unique about it is that it enables utilities to send signals to buildings. I want you to imagine the hottest day of the year. People are getting off work, driving home, and what’s one of the first things they do when they walk in the door? They turn on their air conditioners at the same time. These tend to be the highest demand hours of the year, and the grid has to be overbuilt to accommodate them. It would be like building a 100-lane highway just to accommodate Thanksgiving Day traffic. It’s great for a few hours per year, but then we have to pay to build and maintain all that infrastructure that most of the time is being underutilized. And the more lanes of the highway we drive on, the higher the toll – or in this case the price of electricity – gets for everybody. Now smart meters allow utilities to send signals to buildings that are like, “Hey, we’re about to have a really expensive event on our hands. If you are willing, we will pay you to reduce your demand.” And literally with the instantaneous flip of a switch, buildings help the grid balance, including instances when variable renewable energy like solar and wind suddenly become unavailable. This is known as demand response. Another way to help the grid balance is by storing excess solar and wind energy, then dispatching it later as needed. Yet going 100% renewable requires a ginormous amount of storage. We can get some of it from grid-scale pumped hydroelectric energy, and some of it from electrochemical batteries. But there’s another way to store energy – in a building’s thermal mass. So imagine that you take a liquid material and embed it in the bricks that make up the wall of your building. It’s a hot, sunny day, so using available solar energy, the grid instructs your building to turn on its air conditioning at 2pm. The liquid material freezes, and AC shuts off at 5pm. The building then acts like a giant cooler, keeping the occupant comfortable without having to consume electricity at the worst part of the day. And while all of this is fantastic, even if we could go zero carbon tomorrow, so much inertia has been built up in Earth’s system that global climate conditions would continue to deteriorate for decades to come. That means more extreme weather events, and more prolonged power outages. Now it would be great if everyone could evacuate to safe locations, but for a variety of reasons that remains impractical or impossible for far too many people. That means we need ways to help people shelter-in-place safely. And if you need buildings to maintain safe thermal conditions longer and with less energy, two of the most valuable assets are high-quality walls and windows. Combine that with network connectivity and smarter controls, buildings will eventually be able to prepare themselves thermally and electrically when adverse conditions can be predicted ahead of time. And unlike centralized power plants or even solar panels, energy efficiency and demand response can be deployed absolutely anywhere. Now look, I fully acknowledge that there are other resiliency strategies out there. Utilities must continue to harden our electrical distribution system, and communities should have up-to-date climate and disaster preparedness plans. But as long as climate change remains a wicked problem, everyone one of us, in our own capacities, is going to have to do what we can. Then maybe, collectively, we’ll get to the point where tragedies like the one in that Hollywood, Florida nursing home never have to happen again. California governor Jerry Brown was a guest speaker at the American Geophysical Union’s Fall Meeting in San Francisco on December 14, 2016. A strong supporter and defender of science, Jerry Brown gave an impassioned speech regarding how California was going to stand up to the threats against science posed by the Trump administration. The governor’s spirit should serve as inspiration to scientists everywhere. Often when you’re moving along at a tepid pace, you’re not going to get there. When someone [read: Trump] comes along and says, ‘Let’s blow it all up!” sometimes it wakes us up. Some people need a heart attack to stop smoking. Well maybe we just got a heart attack! In California we have the scientists; we have the lawyers, and we’re ready to defend. If Trump turns off the satellites, California will launch its own damn satellites. We’re going to collect that data! If they start deleting [climate] databases, we’ve got a lot of databases in California; we can take a few more. Our new Secretary of Energy would come to California and say, ‘Come to Texas because we have all the jobs in Texas.’ Well Rick, I’ve got some news for you. California’s growing a hell of a lot faster than Texas. And we’ve got more sun than you have oil! And we’re going to use it! 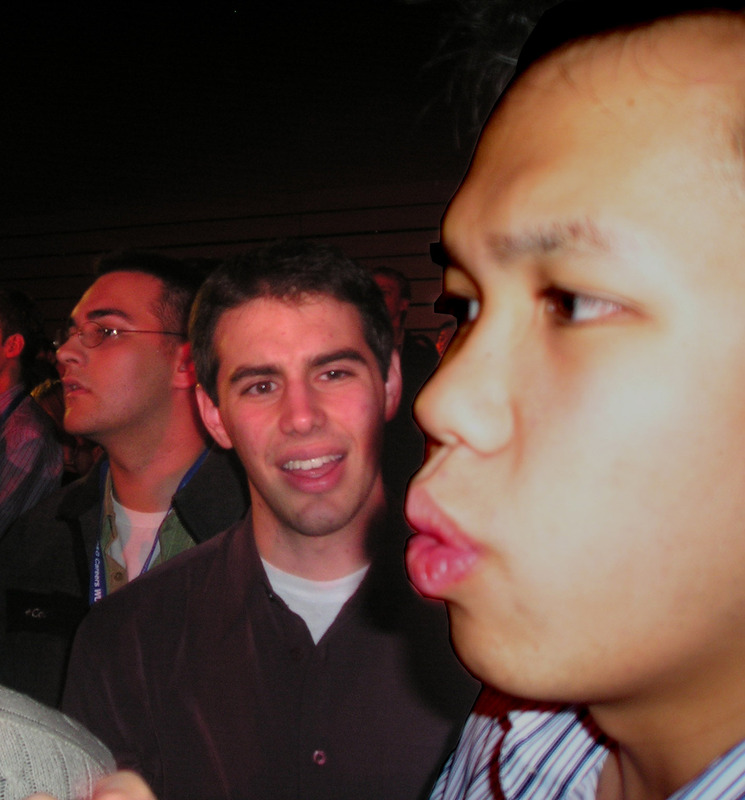 Several years ago I found myself in a room with people on the forefront of the climate movement. 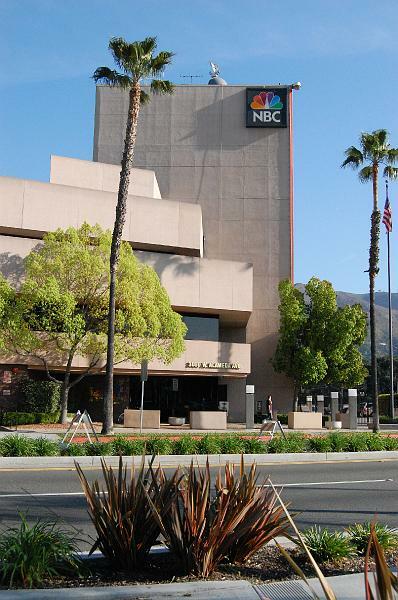 Among their ranks were journalists, advocates, and members of nonprofit organizations. These science communicators had gathered to address an issue each of them had been grappling with – how do I find all of the information that I need and communicate it with the people that need to hear it? The questions seemed so fundamental that I had assumed everyone in attendance already knew the answers. I didn’t, of course, because I was the outsider. As an astrophysicist, research for me is relatively straightforward. There are a limited set of journals that cover our field and a convenient web interface, NASA’s Astrophysics Data System (ADS), to search across their articles.1Friends in other fields have sung the praises of similar programs like EndNote and Mendeley. The program not only links users to all references in an article’s bibliography, but also reports which papers ended up citing that article. Smart engines could even recommend other papers to read based on your selections. I have found tracking down information online in the realm of climate/energy policy to be more difficult. 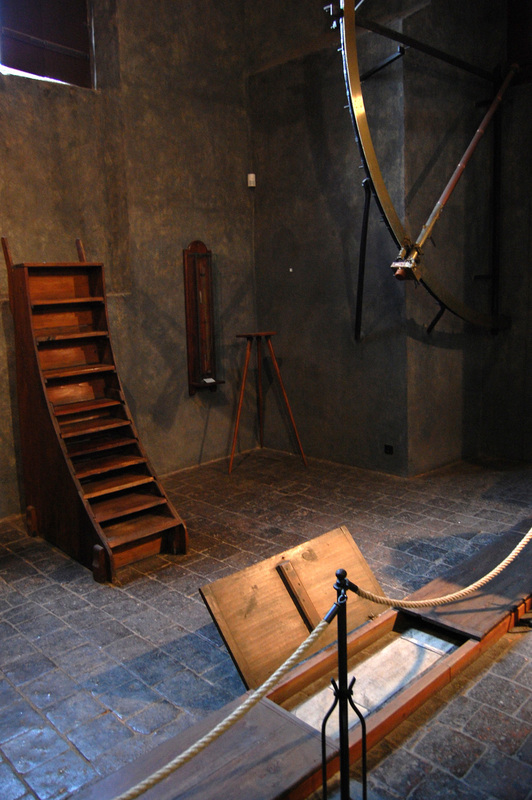 There are many more organizations doing independent research or running their own initiatives. Think tanks, NGOs, and government agencies are more likely to publish and promote on their own websites than through peer-reviewed journals. The impacts of climate change are so vast that they cut across traditional academic disciplines. They influence weather, oceans, atmospheres, ecosystems, human health, urban development, energy systems, breakthrough technologies, and many more. When information is so widely dispersed, and we lack smart engines to find them automatically for us, what should our information collection strategy be? I don’t profess to have the “right answer” to this problem, should one even exist. But I’ve spent enough time gathering suggestions from others and trying them out for myself that I felt compelled to report some of the strategies and sources that have worked for me. Before I begin, I want to comment that you can’t put everything together overnight. I’ve found that so much of the process is just keeping your ear to the ground. When an article I’m reading references an organization with which I’m unfamiliar, I jot it down. I visit their website, make a note about their mission and, if they have them, subscribe to their newsletter and Twitter feeds. I use Twitter lists to tag the feeds and keep them organized. A great first source for content is Google, which offers among the best suite of tools for aggregating real-time news. Through Google News, you can personalize your news feed to return only the topics and regions you are interested in. The service allows you to specify whether you want content rarely, occasionally, sometimes, often, or always. Google Alerts goes a step further and contacts you when new information becomes available. Many news outlets offer the same capability. If you are having difficulty deciding what’s important in the moment, the very cool newsmap may be the tool for you. Powered by Google’s search engine, newsmap visualizes the news by separating it into color-coded categories like World, National, Business, Technology, Sports, Entertainment, and Health. The color saturation reflects how old the story is, while the size shows how much it is being reported online. As with Google, you can filter by country and newsource. It’s a handy way to ascertain what’s hot right now. Over time, or perhaps through a mentor, you may discover that your field has its own news/reference engines. Lawyers gather their research through the library database LexisNexis. Climate and energy folks have the Global Reference on the Environment, Energy, and Natural Resources (GREENR). Environment & Energy Publishing reports all the top developments. The news and analysis website Responding to Climate Change (RTCC) provides the latest news regarding low carbon developments. Another great way to be exposed to new content is through Flipboard2and Zite, which it recently acquired. After signing up, Flipboard presents you with an absurd number of topics to choose from. They range from the conventional (e.g. religion, technology, art) to the more specific (e.g. industrial design, startups, social justice). You select the topics that interest you and Flipboard scours the web to produce a curated magazine readable on most devices. You can also stumble upon new content using, well, StumbleUpon. It has the same idea, but rather than curating material, it randomly deposits you at relevant webpages until you press a button to “stumble” to the next one. I have found a lot of really excellent content through this service. Because the combined readership of an article or report is likely to possess more cumulative knowledge than the authors themselves, one should never discount the value of user comments. Sites like the New York Times and Ars Technica have great comment engines where user contributions can be elevated to “reader’s picks” or “editor’s picks”. It’s a great way to sample the wisdom of the masses and be exposed to a much broader perspective. It literally took me years to assemble the repository of references I now possess. In the world of climate and energy policy, I found that information typically arrives in one of three forms – organizational reports, raw or lightly processed data, and independent projects. Organizational reports are usually published by issue-focused research groups. For climate and energy, there are way more than I could name here. These include the National Academy of Sciences, the United States Global Change Research Program, the Union of Concerned Scientists, the Information Technology and Innovation Foundation, Brookings, Energy Innovation, and many more. Two of my personal favorites are the George Mason University Center for Climate Change Communication (4C) and the Yale Project on Climate Change Communication. These academic centers were created to conduct unbiased social science research on how people engage with climate change. They discovered that people are more concerned about “global warming” than “climate change.” They reported what weathercasters think about climate change and its impact on weather, and questioned whether the level of sciencific consensus on climate change ought to be communicated numerically or non-numerically. The second form information arrives in is raw or processed datasets. Government agencies like NASA and the National Oceanic and Atmospheric Administration (NOAA) are great resources here, as they have tons of images, datasets, and visualization tools that let you tell your own story from primary sources. The U.S. Energy Information Administration (EIA) and International Energy Agency (IEA) also offer tons of data to play around with. Some groups are content to curate data in very specific ways. The Database of State Incentives for Renewables and Efficiency (DSIRE) categorizes state policies that promote renewable energy as either financial incentives or rules and regulations. Frack Track provides a self-described “geospatial policy tool” that analyzes and visualizes Pennsylvania’s new wave of gas development on the Marcellus shale. Wells, permitted sites, and locations of violations are provided on a map. The third form is independent projects, a term that I’m admittedly using as something of a catchall. These include initiatives that aim to tell the story of climate change in unique ways. For example, for their project Atlantic Rising three friends started a journey to travel the 1-meter above sea level contour line to see what life would be like in a flooded world. They interacted with thousands of people in 22 countries gathering photos, film, and writings as they documented the changing lives of those along the rim. Photographer John Weller believes the best way to protect the environment is by reminding people of nature’s visceral beauty. He spent a decade traveling to the rough waters of the Ross Sea, probably the last, undamaged ocean ecosystem left on earth. His stunning photographs of the region’s living creatures, both above and below the water, have been cataloged in the book The Last Ocean. Finally, it is sometimes most useful to just speak to people personally. While conferences can be a great place to do this, these environments can be intimidating for newcomers to a field. There are some tricks you can employ to make this process go more smoothly, but I will reserve them for a future post. Of course, simply having information is not enough. You must synthesize and deliver it to your audience in an effective way. This raises a whole new set of challenges that I will get into in my next post. 1. 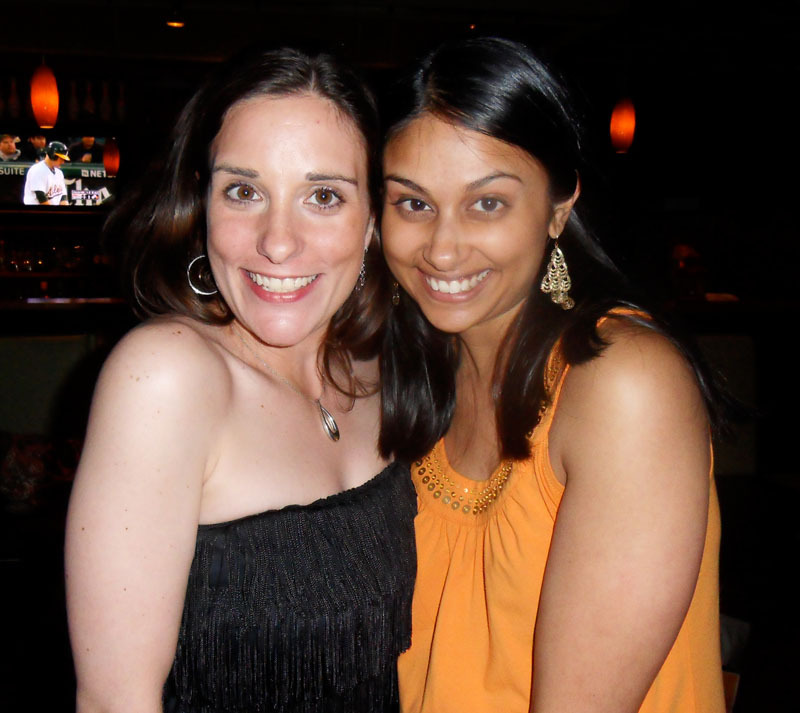 ↑ Friends in other fields have sung the praises of similar programs like EndNote and Mendeley. Part 3: Freedom of Information Act to the Rescue? In brief, these articles describe how scientific research gathered by the United States government is often withheld from the general public, a type of action that can quite literally put lives at risk. The Freedom of Information Act (FOIA) was passed to allow public access to these records, but both the George W. Bush and Obama administrations have so far failed to live up to the promise of the act. But while there have been substantial challenges with gaining access to important public information, it’s not all doom and gloom. The fact that we actually have a Freedom of Information Act with an appeals process and judicial review is significant. The Act continues to have strong support in the NGO community. A FOIAonline portal has been built with the goal of eventually becoming a one-stop shop for public information. The Obama administration has taken a strong positive step at Data.gov to “increase public access to high value, machine readable datasets generated by the Executive Branch of the Federal Government.” This initiative has already saved on infrastructure costs. And we have had disclosure successes. In 2008 the United States improved the Consumer Product Safety Act and created a searchable database for consumer information. The National Oceanic and Atmospheric Administration’s (NOAA) National Climatic Data Center and EPA have done an admirable job of reporting on historical climate variables like temperature, precipitation and drought. The US Embassy in Beijing has made electronic reports of air quality public when the Chinese government refused to do so. The federal ENERGY STAR program labels the energy footprint of appliances to aid consumers in making more energy efficient purchases. Inside federal agencies, it would appear that some progress is being made. In 2013 UCS released a report entitled Grading Government Transparency in which they examined the ability of scientists at federal agencies to speak freely about their work. They found that many agencies’ media policies “have shown significant improvement since 2008.” In particular they note that scientists can now more easily apply their right to express personal views provided they make clear that they are not speaking for their agency. Then, on February 25, 2014 the US House of Representatives unanimously passed the FOIA Oversight and Implementation Act. This amendment to the Freedom of Information Act would create a single, free website from which all FOIA requests could be made. When requests are granted, federal agencies would have to release the information in an electronic and publicly accessible format. When requests are denied, the appeals process would be streamlined. The amendment also forces federal agencies to take greater responsibility for their FOIA obligations. As we see, the system can work. But there will always be disagreements between the public and federal agencies regarding which information should be disclosed through FOIA and which should be withheld for security reasons. When public actors feel their claims have been rejected unjustly, they can always consider seeking subpoenas. Absent that, there are other options at their disposal to extract greater value out of the information that is public. Private technology companies can offer tools for the sharing and analysis of data. Librarians can play a more prominent role in gathering and organizing documents. When the information being disseminated is incorrect, knowledgeable scientists should take action. They can start issue blogs and connect with members of the media. Local groups like city councils rarely hear from scientists, so researchers can have an outsized impact in regional issues. As members of one of the most respected professions, scientists would do well to build relationships with congressional representatives or their science staffers. Failure to act means allowing dissembling voices fill the vacuum. With respect to government disclosure, as with most things, the situation is neither entirely good nor bad. But it is hard to deny that at times we Americans live in a perverse, ironic ecosystem – one in which taxpayers fund government research designed to inform and protect, only to have that same government deny us the results and claim it’s for our protection. We must continue to hold our government accountable, push for transparency where appropriate and never yield to private interests who would use our ignorance against us. In brief, these articles describe how scientific research gathered by the United States government is often withheld from the general public, a type of action that can quite literally put lives at risk. The Freedom of Information Act (FOIA) was passed to allow public access to these records, but we discovered that for a number of reasons, the George W. Bush administration was overly eager to deny such requests. This memo was part of Obama’s Open Government Initiative, “committed to creating an unprecedented level of openness in Government.” Yet surprisingly, government transparency barely improved from the Bush administration and, according to some journalists, got worse. A full 30% gave him a grade of poor to very poor. Recently, OpenTheGovernment.org released an assessment saying that many sophisticated users of FOIA remain tremendously disappointed with the law’s implementation. There are between 600,000 and 650,000 FOIA requests per year. While less busy agencies can respond within a few weeks, larger agencies like the Department of Defense are flooded with more requests than they have the resources to meet. In these cases, FOIA compliance has effectively become an unfunded mandate. The situation is worsened by the fact that many agency employees are overworked, undertrained, and generally unclear of their obligations under FOIA. A Bloomberg News investigation last year set out to test the quality of current FOIA compliance. A team of reporters submitted the same FOIA request, for the travel expenses of top agency officials, to 57 agencies. 19 of 20 cabinet-level agencies did not comply within the mandated 20 day window. Even “well past that legal deadline,” about half of the agencies had still not fulfilled the request. In some cases information is available, but in a form that mitigates its usefulness. Despite Obama’s promise of an online data repository, many information requests still need to be made in person. A significant number of records remain incomplete or redacted. Often data is not in a convenient format like PDFs or tables. Nonuniformity abounds. At the SEC there are different record systems in every department. There is no uniform method to submit a FOIA request. Some agencies accept submissions by e-mail and others by fax. Some ask the user to complete a web form. Requests to the IRS must actually be sent by post. Despite President Obama’s vow to “restore science to its rightful place,” scientists who wish to reach out to the public about their research findings were routinely prohibited by public affairs, removing the power of interpretation from data that rarely speaks for itself. They are often denied the right to review, prior to publication, the final versions of reports to which their names are attached or to which their research contributed. Even their ability to obtain access to drafts and revisions of such reports is limited. Even if adequate information is ultimately disclosed, delays can mitigate its usefulness. An environmental assessment of TransCanada’s controversial Keystone XL pipeline was criticized by many as giving insufficient consideration to its effects on the climate. The report’s integrity was further compromised when it was discovered that the authors had not only been previously employed by TransCanada, but had published a similarly positive assessment of a Peruvian liquified natural gas pipeline which has since racked up an abysmal environmental and social track record. These and other concerns were meant to be addressed during a 45-day public comment period, but the State Department (which commissioned the report and has final say on the pipeline’s approval) declined to release those comments, a practice that is routine at other agencies. A FOIA request was submitted, but when an approval decision is expected in the “near term,” any delay in meeting the request can limit the public’s ability to meaningfully influence the outcome. In fifth and final part of this series I describe how it’s not all doom and gloom! I will outline some of FOIA’s successes as well as highlight improvements that offer hope for the future. Freedom of Information Act to the Rescue? In brief, these articles describe the circumstances surrounding the rupturing of a coal fly ash containment pond in Roane County, Tennessee. Government sponsored research that reported the health and environmental risks of such ponds was buried, redacted or otherwise hidden from public view. The spirit of FOIA embodies the essence of our American democracy. We hold that a representative government by the people can, through its collective capacity, understand and prescribe solutions to threats against us. We hold that a representative government for the people will utilize such knowledge for the security of its citizenry. We hold that a representative government of the people will be served by the sacred trust we bestow upon our elected leaders. Of course, there are many sensitive issues for which government secrecy is in the national interest. But the Ashcroft Memo established a sweeping protection for agencies to deny data from the general public as long as they could make some argument about how disclosure would jeopardize law enforcement effectiveness, security, business or privacy. Given that nearly every issue of import touches at least one of these four categories, FOIA requirements could essentially be ignored at the government’s discretion. This secrecy has consequences. When leaks and spills contaminate local streams and water supplies, scientists are limited in assessing the impacts. Without knowledge of leaks’ chemical compositions regulation is difficult to justify and contamination is hard, if not impossible, to detect. All of this serves to reduce the gas industry’s accountability for harms it might cause. This attendant ambiguity made it easier to pass a provision in the 2005 Energy Policy Act that explicitly exempted fracking fluids from the Safe Water Drinking Act. It is easy to imagine other circumstances in which the “trade secrets” clause could prove dangerous. If a train, truck or barge carrying hazardous, but classified, materials were to crash, the secrecy exemption could put first responders in grave risk. Sometimes, the government decides that even admitting records exist will damage national security or lead to stigmatization. This justifies the so-called “Glomar response” which allows agencies “to neither confirm nor deny” (read: ignore) FOIA requests. The Department of Justice, the agency responsible for FOIA enforcement, has broadly supported this right on numerous occasions. While about 70 countries have their own forms of FOIA, many are plagued by similar issues. Ireland allows easier access to documents, but many remain unsigned which reduces accountability. Israel does have an appeals process, but such a request can take years and there are no real penalties for non-compliance. Even in the European Union, which tends to be more open, the scope of the right remains unclear partly because of the governments’ unwillingness or outright failure to clarify the issue. In part 4 of this series, we will examine how the widespread hope offered by President Obama’s Open Government Initiative has largely gone unmet. Tucked away at the bottom of a small hill in a distant corner of Johns Hopkins University’s Homewood campus is a large brick building. Metal pipes protrude horizontally from its side before diving perpendicularly into the ground. Its tall, curved top windows, rooftop smokestack and mysterious purpose are vaguely reminiscent of the factory from the classic 1971 film Willy Wonka and the Chocolate Factory. And much like the Wonka factory, no student ever goes in and no student ever comes out. This building is the Homewood Power Plant, the facility responsible for providing electricity, heating, and cooling to the Homewood campus in central Baltimore City. As part of Earth Week @ Johns Hopkins, the university’s Department of Facilities Management granted me a walkthrough to learn exactly what happens within. 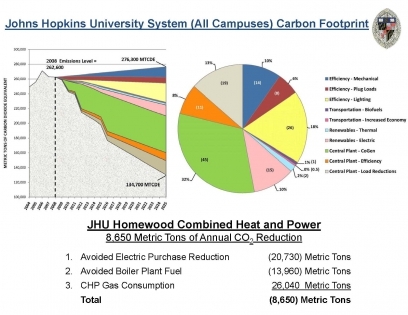 The JHU Power Plant plays the same role as an electric utility’s generation station. Fuel goes in and electricity comes out. 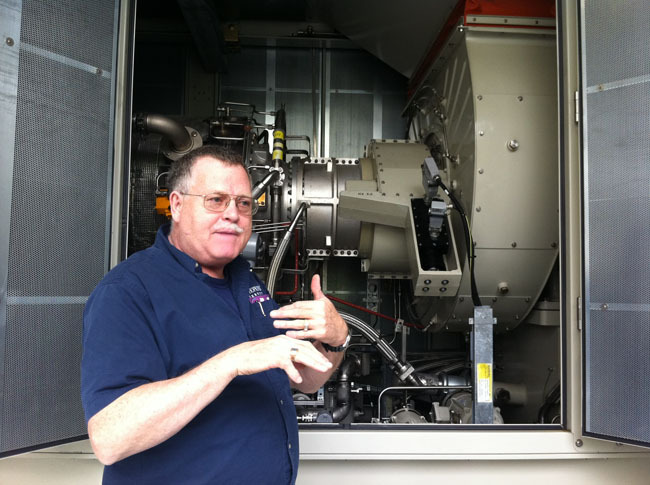 BGE, Maryland’s electricity provider, achieves 35% efficiency in this process. What this means is that for every 100 units of fuel energy that goes in, 35 units of electricity comes out. The remaining 65 units are expelled as waste heat through the Chesapeake Bay Cooling Tower. Principles of thermodynamics and engineering limitations make it difficult to achieve higher efficiencies. This is unless, of course, you manage to reclaim that waste heat for something useful. This is where Homewood’s Cogeneration Facility comes into play. 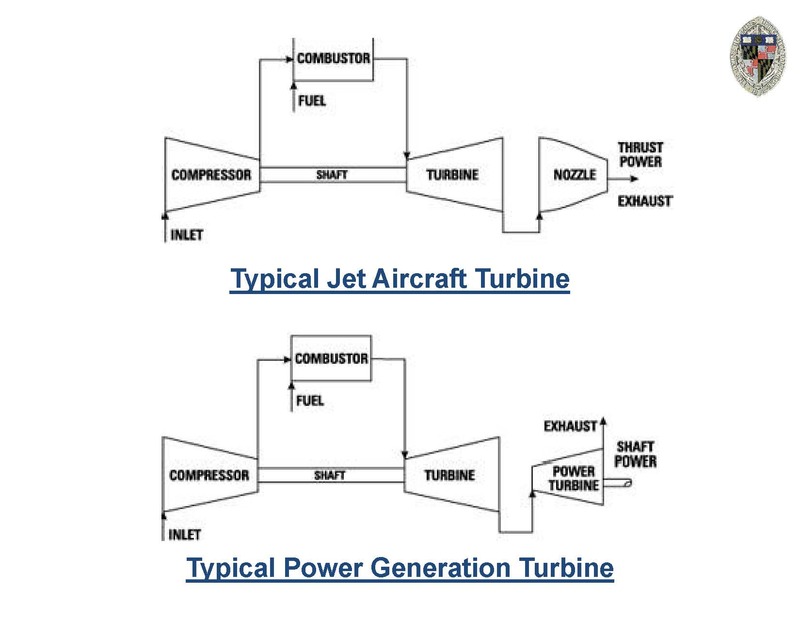 Cogeneration (which stands for Combined Heat and Power System) is a process in which both electricity and useful heat (steam) are simultaneously produced. The 65 units of waste heat, which would otherwise be discarded, are diverted to a waste heat recovery system. 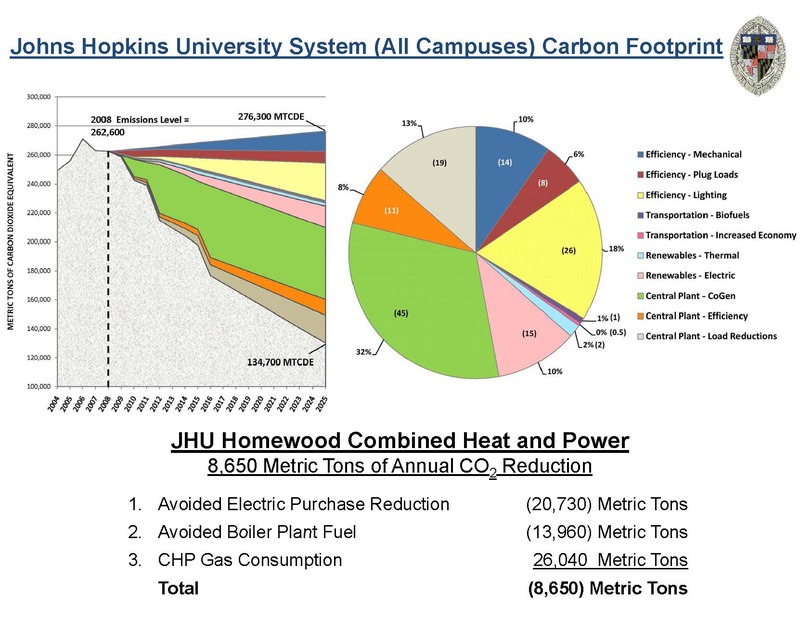 The 4.2MW Power Plant, which opened in June 2010, is part of JHU’s plan to reduce its greenhouse gas emissions by 50% in the next 12 years. “Our approach has us looking at energy efficiency, energy conservation, more sustainable energy choices and renewable energy,” added Mr. Kirk. 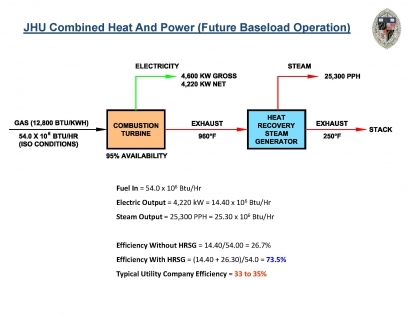 If this system seems like a no-brainer, then why doesn’t BGE do it itself? The problem is that piping steam over long distances is an incredibly inefficient operation. Much of the steam’s heat will be lost in the process. That’s not to say utilities don’t do it. It’s just that circumstances have to be right. 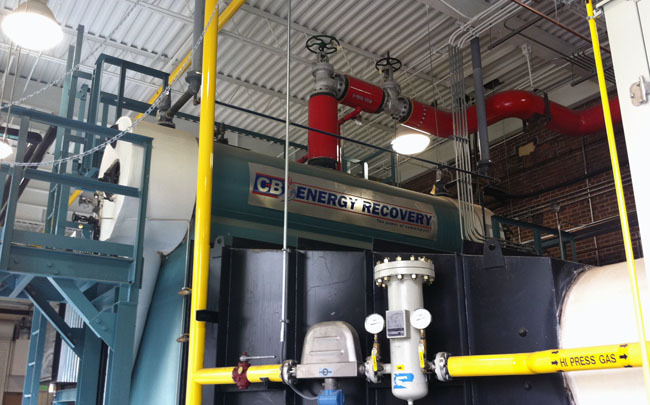 For example, Con Edison, New York City’s utility provider, uses a collection of cogeneration plants to heat around 100,000 densely packed buildings in Manhattan. This explains the familiar image of steam rising through city sewer grates. It also explains why cogeneration plants must be closely located to end-users. Closer proximity also lessens transmission and distribution losses over power lines and provides greater security in unstable energy markets. The high energy requirements and dense arrangements of college campuses, hospitals, military bases, etc. make them attractive candidates for this type of technology. 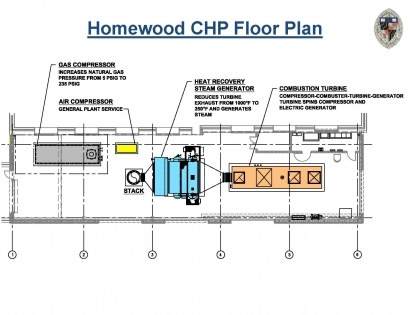 The Homewood cogeneration unit joins a small handful of others in the region. Two have been installed at Johns Hopkins Hospital and a couple others are at the University of Maryland at College Park and Mercy Medical in central Baltimore. The limiting factor prohibiting everyone from installing cogen plants is cost. 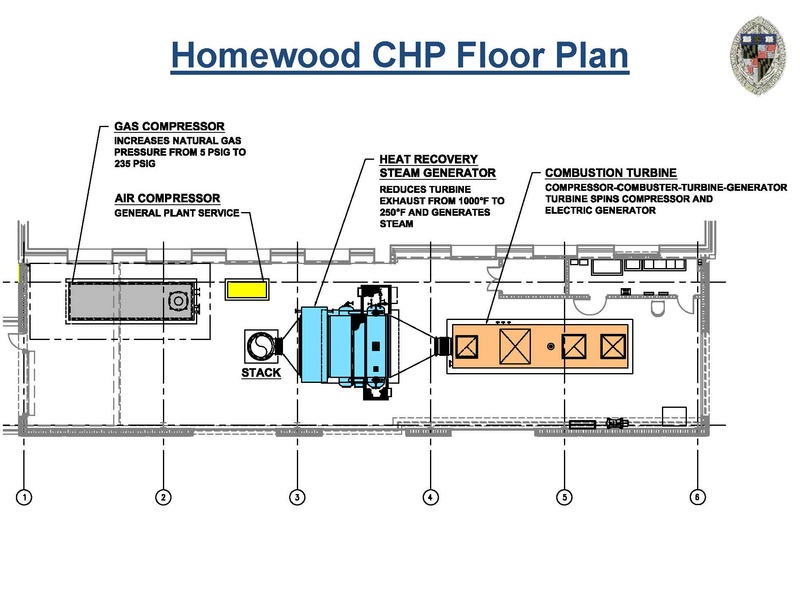 The Homewood campus was fortunate in that it had a large, unused space directly above one of its on-site combustion turbines. The facility cost $7.5 million to install and will pay for itself in energy savings in about seven years. Despite the plant’s net energy savings, this project was not always economically viable. It was Maryland’s deregulation of electric utilities in 1999 that turned the tide. The Homewood campus remains reliant on electricity purchased from BGE. 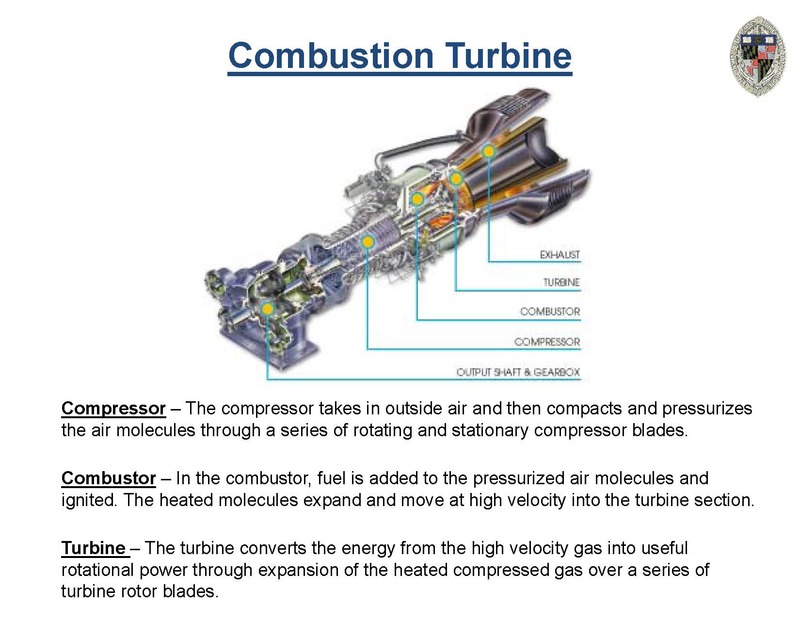 According to Mr. Macomber, when all things are considered the total amount of Homewood’s energy generated by the power plant is 20% in the summer and 30% in the winter. There are tons of organizations that have done research related to energy, climate and policy. Over the years I’ve aggregated a (non-comprehensive) list of those agencies. If you would like to suggest additions, either post them in the comments or tweet them to me @mspecian and I’ll update the list. I recognize that my website is sorta oddball. “Serious” articles on topics like green development in Africa, sustainability and climate are interspersed with professional wrestling results, games and personal photography. This motley assortment of content precludes this site from being a pure issues blog. While I have considered going in that direction, I built mikespecian.com to be a reflection of me along multiple dimensions. So for now I intend to keep it as is. With one exception. I have added a link entitled Articles to my main menu. This is will be the one-stop-shop for everything I have written and will continue to write on topics such as climate, energy, politics and science in general. Thank you all for reading!